Lene Leth Rasmussen is a Danish designer based in Copenhagen. She is interested queer interaction design and mobile computing. Lene feels that queer subcultures need physical meeting places, however a place can’t be queerified in one go as the queer stories of a place must be heard and retold again and again before they become a part of the core story about a place. 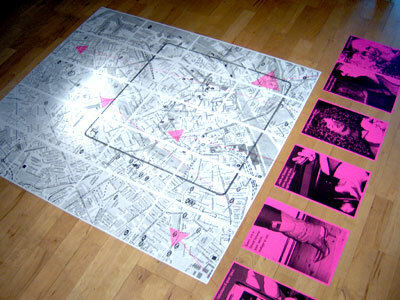 Her design project “queer mobsites” at the Malmö Högskola (2006) is based on cell phone technology. By downloading a queer software that facilitates interaction with other queers the user can contact other queers by cell phone and arrange meet them at informal meeting places in urban areas, thus queering new spaces in their local community. Lene is not trying to design a parallel “pink world” as there is no world outside the heterosexual matrix. Instead she’s designing a tool for a target group of self-identified queers, – a tools to strengthen queer sub cultural alliances, which can be seen as alliances of power resisting the heterosexual mainstream. Empowerment of queers is one of the qualities of her queer design. Her design project is a good example of how queer theory can be used in interaction design for queer people and other marginalized social groups. Lene’s project paper: Queer Mobsites Queer mobile computing. Queerteori i interaktionsdesign, Lene Leth Rasmussen. Interaktionsdesign master. Eksamensrapport. K3. Malmö Högskola. 2006.